Part 2 of Buffalo soldiers at Fort Huachuca begins with a recap of the contributions of the 10th Cavalry in the Punitive Expedition, a campaign that was covered in Part 1. It then chronicles some other little known actions along the Mexican border, including the Yaqui Fight, in Bear Valley and the Battle of Ambos Nogales. It closes with a discussion of the Army reductions following World War I and how they affected the black regiments at Huachuca. As is the intent with all Huachuca Illustrated magazines, there is a good deal of social history covered under the headings of U.S Army Lifestyles at Huachuca or in the form of first-person remembrances called Voices from the Canyon. These purport, with the immediacy of someone who was there, to convey what it was like to be a soldier or dependent at Fort Huachuca in days gone by. A Timeline provides reference markers along our Huachuca chronology while a section called Roll Call gives us some biographical insights into some of the notable performers on the Huachuca stage. Articles called Military Intelligence in the American Southwest acknowledges that the Fort Huachuca Museum also serves the Military Intelligence Corps which now calls Fort Huachuca its home, in addition to interpreting the history of the U.S. Army on the Southwestern frontier. Part 3 of Buffalo Soldiers at Huachuca will complete the story of the African-American regiments along the U.S.-Mexican border by covering the period 1929-1939. Several volumes are planned to cover the complete 150-year history of the U.S. Army in the American Southwest. We hope our readers will take away from this series a better understanding of the important role played by Fort Huachuca in the national defense picture and better appreciate the contributions of the men and women, soldiers and civilians, who served their country across these incomparable vistas of the American Southwest. Expedition into Mexico, discusses life styles at Huachuca in the teens and 1920's, and covers the Apache Indian Scouts at the post during the 1920s and 1930s. The third issue will cover events at the historic post from the late 1920s to the eve of World War II. 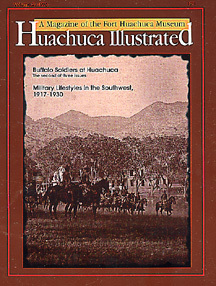 It focuses on the 25th Infantry Division which moved to Huachuca in 1928. As is the case with each of these issues, the Fort Huachuca Museum and its stakeholders owe a great debt to the Huachuca Museum Society, a private, non-profit, all volunteer organization that enables the museum to meet its educational goals. The board that saw this issue through to publication was composed of Chad B. White, President; Vivian E. Blatti, Vice President; David Patterson, Secretary; Gary Munroe, Treasurer; and directors Gerri Bruno and Pat Shane. As in the first issue, all of the credit for the graphics and production work goes to Jeanne Reilly who is far too generous with her ample artistic skills. This issue, like all of the other in the series, is dedicated to the men and women who have made Fort Huachuca the unique place it is. Note about the photographs: Most of the photographs used in this issue are unretouched, historic prints. As such, they sometimes are not of the quality and resolution that would be expected today. However, in the interest of preserving both the flavor and authenticity of the era described, they are included without computer enhancement or alteration. Permission is granted to reproduce for educational or training purposes.